Rates can be paid in local currencies when orders are placed through the authorized sales agents listed on the inside back cover. FAO - The Food and Agriculture Organization of the United Nation was founded at Quebec, Canada in October 1945 when its Member Nations agreed to work together secure a lasting peace through freedom from want. The membership of FAO now stands at 114 nations. 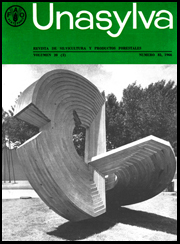 Unasylva - Started in 1947, this quarterly publication is intended to cover a range of interests as wide as that of the Division whose work it mirrors. Signed articles express the opinions of the authors and do not necessarily represent the views of the Organization. Cover. The symbol of the Sixth World Forestry Congress set up in laminated wood at the entrance to the Madrid Fair where an international exhibition covering forestry, hunting, freshwater fishing, equipment and furniture staged. Another feature of the Congress was an international festival of 96 forestry films produced since 1960, from 41 countries: 33 awards were made. "The paper forest," an entry from the United States, won the grand prize. "Usutu" (United Kingdom) was selected as best educational film with the U.S.S.R. film "Reclamation of boggy forest areas" second. "La forêt, pourquoi?" (Switzerland) was judged the best information film, followed by "Nace un bosque" (Cuba).